The following is a list of the 451 missions flown by the 376th HBG. Click on the date to view details of that particular mission. Click here to see a list of the targets reached by HALPRO, the 1st Provisional Group, and the 376th Bomb Group. This mission was discussed in some detail at the four Squadron Meetings. The documentation and anecdotes that came to light at these meetings gives us new insight as to the true nature of this farewell event. This is what emerged from those findings: Mission No. 451 was flown on that day as a single mission, but in two sections. The "Blue" element with 25 planes flew against the Casara RR Diversion Bridge. The Group Air Commander for this element was Lt. Col. George. 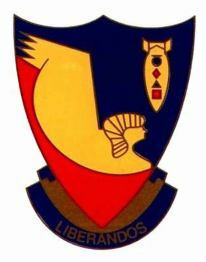 The element was led by the 512th Squadron with the 515th in Box 2, the 514th in Box 3, and the 513th in Box 4. Scheduled take-off time was 07:50 AM and over the target time 12:40 PM. Later that morning the "Red" element flew against the Bologna East area with 38 planes. Group Air commander for this second element was Maj. Holsclaw flying in the lead box with the 513th Squadron. The 514th was in Box 2, the 515th in Box 3, and the 512th in Box 4. Take-off time was scheduled for 10:10 AM with over the target time of 13:51 PM. This mission, No. 450, was known as the "Farewell Mission" of the 376th in the European Theatre. It was this incentive that brought the Group to bring out and up every plane on the field. The Group mustered 63 airplanes that day. "Some had been non-operational," officers who were with the Group then report. "Some had been dismantled of guns and flew unarmed against the ebbing and almost absent Luftwaffe. All carried all the bombs possible. It is a traditional joke among those of the Group who still remain with it, that 'everything but the kitchen sink' was in the air." Thus ended the final phase of combat for the 376th in the ETO, for letter orders were issued as of 12 April 1945 by the 15th Air Force, for the movement of the Group to the United States. Editor's note: The records of the 376 show 2 sets of sortie reports for 2 different targets on April 15. Only one of those targets is reflected in the Liberandos. Mr. Morris is correct.